When I die, I’m drafting a will, no doubt about it. It’s easier for everyone to have absolutely no say in the dividing of the remaining estate. You hear about it all the time. Brothers and sisters fight over possessions for sentimental or financial reasons, or whatever. If you care about your family (and if you’re smart), you will draft a will. But as Hélène (Edith Scob) puts it, there’s very little reason to care about what happens after you die when you’re dead. Summer Hours, from writer and director Olivier Assayas (Late August, Early September), tells the story of how three siblings decide to divide their deceased mother Hélène’s valuable estate and the family collection. The film opens with Hélène’s 75th birthday party. 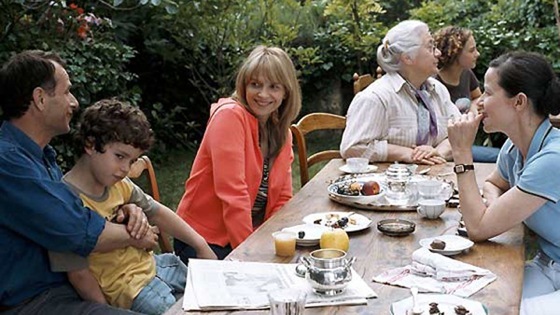 Hélène’s three children; Adrienne (Juliette Binoche), Frédéric (Charles Berling), and Jérémie (Jérémie Renier); her two daughters-in-law, and her many grandchildren gather at her house (which she inherited from her famously artistic uncle) for what will be the last time. There should be much to celebrate. It’s Hélène’s birthday. Her children, with their families and their busy lives, are all under one room for the first time in a long time. There’s life again in the house that Hélène spends mostly alone with just the longtime cook and housekeeper Éloïse (Isabelle Sadoyan), but that joy is fleeting. Hélène knows this all too well, even choosing to quickly discuss with her eldest son Frédéric what to do with her possessions when she dies. Since Frédéric is the only one who still lives in France (Adrienne lives in New York, while Jérémie and his family live in China), it would make the most sense for him to deal with the handling of the estate. Frédéric scoffs at the notion of his mother dying anytime soon and tries to reassure her that the house will be kept in the family for her grandchildren to decide. But Hélène is wise and makes sure that he knows what should happen to the most valuable (and her most beloved) items. I think the most poignant scenes are with Éloïse, which show how she exists in relation to Hélène and the house. Frédéric makes sure Éloïse is taken care of, ensuring she gets what money Hélène left her, allowing her to keep an item from house before everything is gone, and confirming that she has some place to stay (with relatives he’s told). But the siblings only know of Éloïse as part of the house, and once it’s sold they think less about her because they recognize little about her devotion to the family and what the family meant to her. There’s an incredibly touching scene of Éloïse surveying the empty house, only from the outside since she no longer has a key. Assayas tells the story as matter-of-fact. This is how the handling of possessions is dealt with after people die; however, times are changing. When Hélène’s brother died, she kept the house and all of its innards exactly the same. When she died, her children kept what they wanted and sold the rest. This theme of generational gaps in attitude and perspective repeats. Since Frédéric is handling the estate, you get much of his point of view. He wanted to keep everything the same, and it hurts him to see a future without the family house. That’s life, it’s sad, but it goes on. Summer Hours was filmed in 1:85:1. Assays supervised the high-definition digital transfer (which was approved by him and cinematographer Eric Gautier). The colors appear plain and surprisingly unlively (even during scenes at the house with the kids playing in the garden), which coincide with the film’s matter-of-fact approach to life and art. The film features a DTS-HD Master Audio soundtrack mastered from its original 24-bit audio files. The audio is extremely sharp, especially during the early part of the movie at the house where you can constantly hearing birds chirping in the background. Criterion Collection is one of the few remaining distributors that still include booklets with its releases. The booklet contains rich movie stills and an essay “A Time to Live and a Time to Die” by critic Kent Jones. Also included are three video features. One is a thirty minute interview with Assayas who discusses his inspirations, his life, and how they all impacted his career and especially Summer Hours. There is a thirty minute making-of documentary that has interviews with Assayas, Berling, and Binoche, as well as behind-the-scenes footage of the filmmaking process. The last extra is an hour-long documentary “Inventory” that examines the approach of Summer Hours to art. The documentary was partly shot in Paris’ Musée d’Orsay, where some of Hélène’s possessions were finally housed and exhibited. The museum, as part of its 20th anniversary, decided to request artists to use the museum as a model for their art. Assayas discussed using the museum as part of Summer Hours, especially having some of its pieces as main characters in the film. Note: Visit the film’s official site.